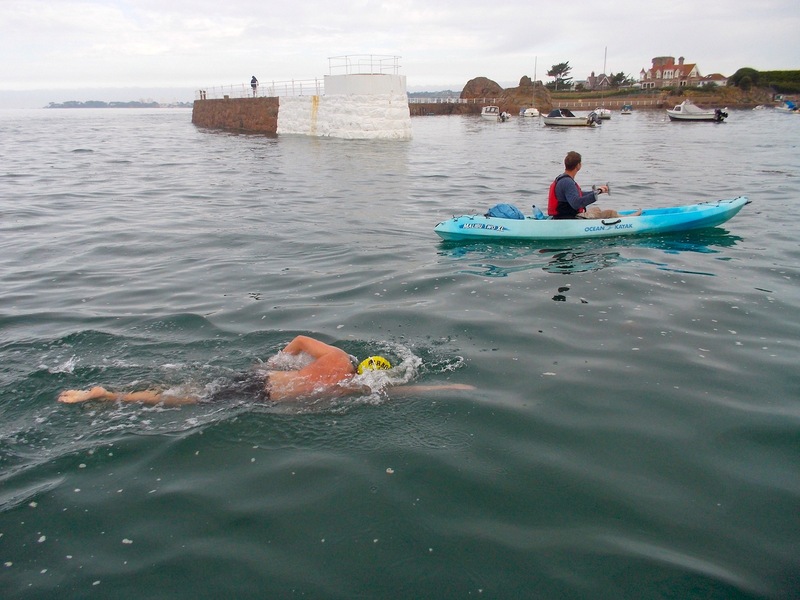 Back onboard the support boat “Sea Swimmer 2”, I was quite surprised to hear that my time was 9 hours 35 minutes. After the slight hiccup around halfway, I was sure that it’d be much closer to 10 hours. In any case, I was delighted with that time. To be only 3 minutes off of Julieann‘s world record was amazing – I’ve had the pleasure of swimming with her on a few occasions and she is a phenomenal swimmer! It was just past 4:00 pm on a hot and sunny day so getting dressed quickly was not a big priority, I decided that I’d be better off to have my recovery drink first. I mixed up my SiS REGO Rapid Recovery with some warm water and tried to drink it… It tasted rotten and it was all I could do to swallow any amount of it. After a few sups, I just threw it overboard and ate some chocolate fingers instead: I had no plans to swim in the next 24 hours so there was no point in forcing myself to drink something I didn’t like. 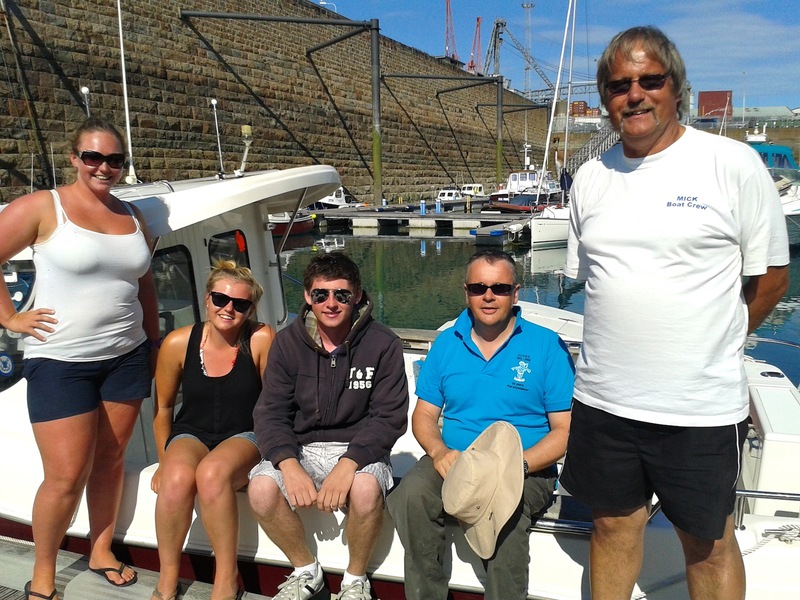 The “Dream Team” back at the marina after finishing. Left to right: Alice Harvey, Chantelle Le Guilcher, me, John Asplet, Mick Le Guilcher. 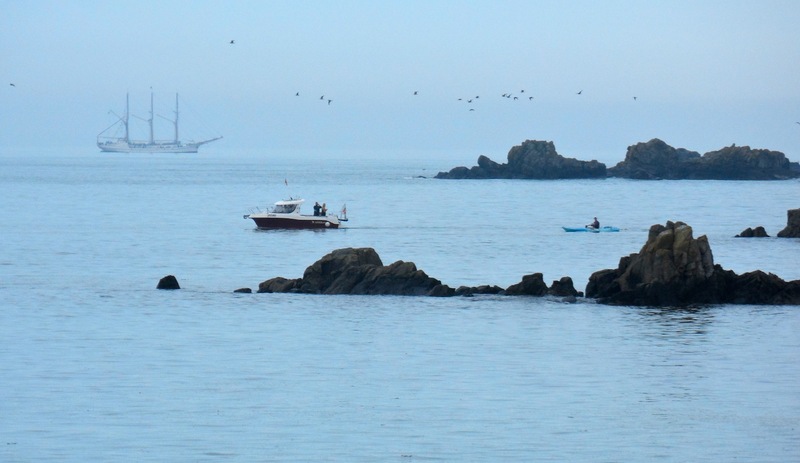 The next day, I took the morning to myself and headed over to St. Brelade’s Bay for a closer look than the one I got during the swim. It was a really beautiful place; a large sandy beach with a pier at one end, a nice park and plenty restaurants along the promenade. It would have made a great place for a swim but I didn’t have my gear. 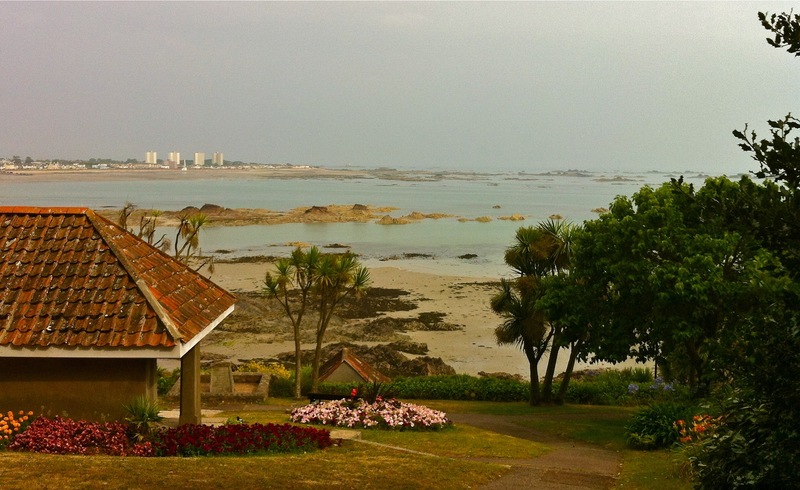 It would also make you eager to explore a bit more of Jersey. A few of those gathered at “Wissant View”, i.e. Sally and Charlie’s house, with the official chart of my swim. Left to right: Alice Harvey, Martin Powell, me, Mick Le Guilcher, Sally Minty-Gravett, Charlie Gravett, Chantelle Le Guilcher. That afternoon, I was again picked up (see how well the JLDSC look after their guests) and taken to the airport to welcome Sally Minty-Gravett home from her fifth English Channel swim in as many decades! Sally and her husband, Charlie, treated us to a very nice evening at their home, during which Charlie plotted my swim course on the Jersey marine chart and the crew all signed it. The next morning I caught the early flight to Gatwick, giving me enough time to head into London to repack my bags and be on the first train to Cornwall. It was great to see family and many other familiar faces when I got there! And so ended the Jersey adventure! I had a great time and am really glad that I went and did it. Lessons were learned: if I feel like there’s nothing left in the tank the solution could be as simple as resetting the stroke, communicate with your crew, Carol‘s advice on feeding plans are well-worth taking, caffeine is magic and bring your own treats! 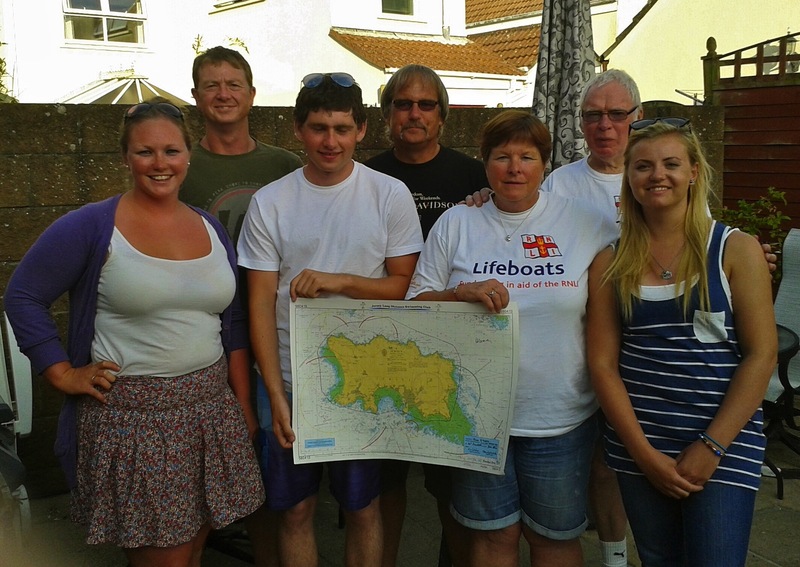 The JLDSC are a great group of people and I couldn’t have done the swim without their help. I was looked after superbly every minute of my few days in Jersey and I can’t thank everyone that I met enough. 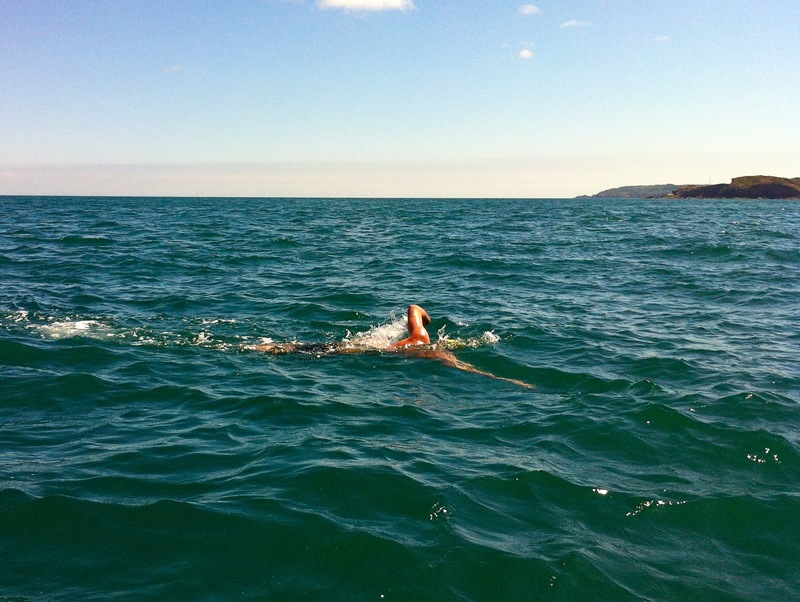 Special thanks, though, to Mick, Alice, Chantelle, John, Martin and Marilyn who were an amazing support through the swim! 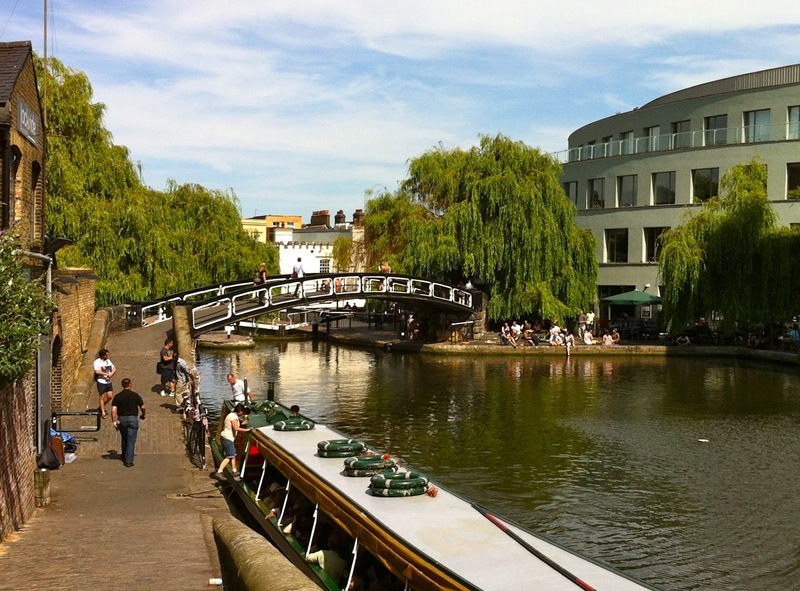 Camden Lock is very near where I stay in London. It’s great for a walk and a bit of people-watching, especially when it’s scorchingly hot, but definitely not an enticing swimming location! On the evening of Sunday, 21 July, I called the pilot, Mick Le Guilcher, who was standing in for Charlie Gravett while he was in Dover with his wife, Sally Minty-Gravett, who was swimming the English Channel that week. 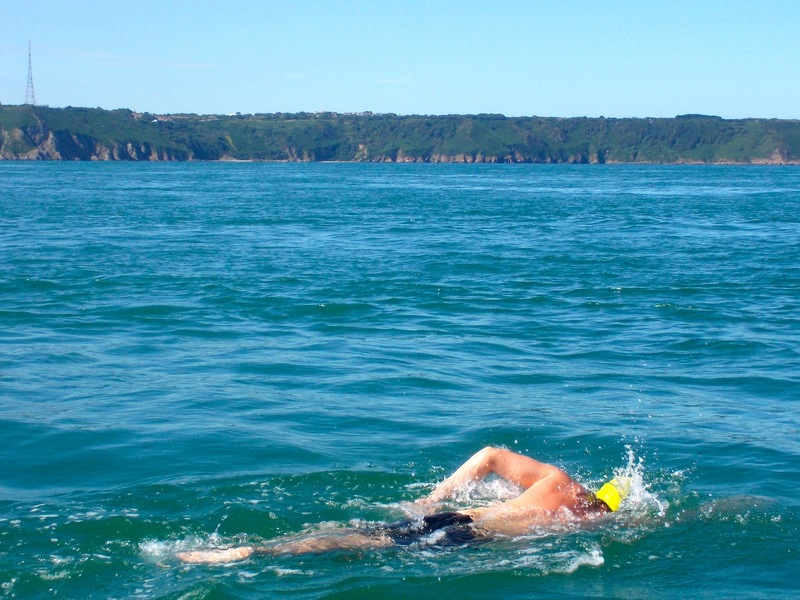 He said that the weather was looking good for a Wednesday (24 July) swim – good news as this was the optimum day to swim as far as the tide was concerned. I immediately booked my flights and accommodation and let everyone know what was happening. 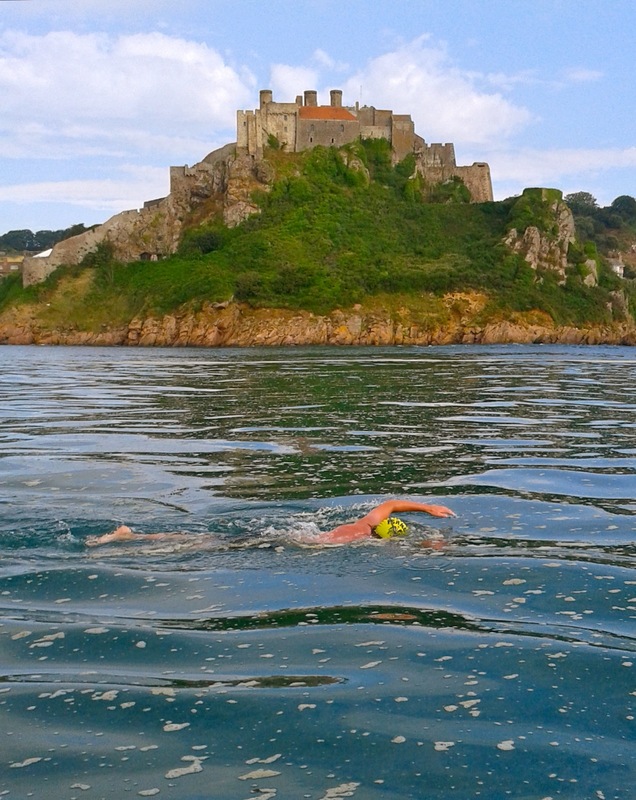 I was delighted to be going, I had heard so many stories of people being weathered out in Jersey so found it hard to believe that my swim was actually running to plan! I went for my last swim before the big event on the Monday: a nice leisurely session under the sun in London Fields Lido, Hackney with Diarmuid Dennehy, a former Fermoy SC swimmer now living in London and training for an English Channel 3-person relay this September. Having got all my stuff together I had “time to take in a show” in the West End for my last night in London! I got a ticket for The Cripple of Inishmaan at the Noël Coward Theatre through my cousin, Brian Fenton, who is an understudy of Daniel Radcliffe (that’s Harry Potter to the lay person) in the show. It’s a brilliant dark comedy and I’d highly recommend that anyone go and see it but it suits an Irish humour better. This was also a good way to relax before the swim and escape the ferocious heat outside! I hope Part 1 wasn’t too boring, I didn’t feel like launching straight into the swim report though. Keep an eye out for Part 2 of the report tomorrow, I’ll actually get on to talking about the swim at that stage! This is going to have to be quick as the battery is nearly gone in my laptop and the charger is broken. 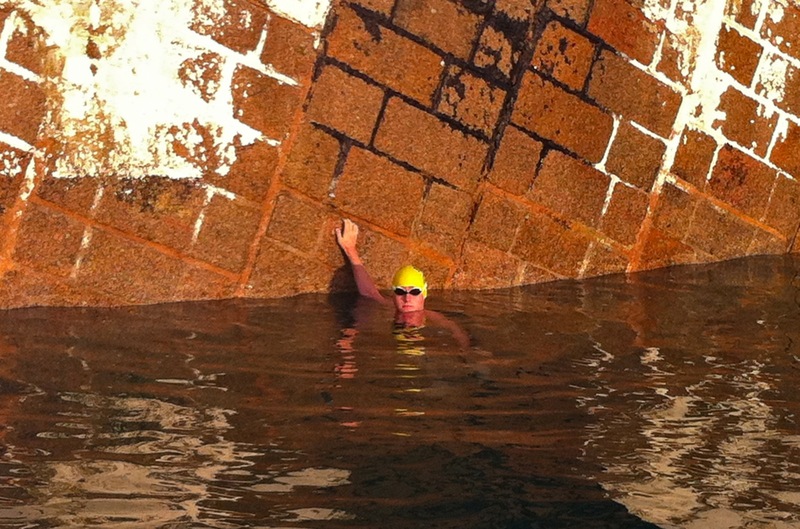 I spoke with my pilot, Mick Le Guilcher, yesterday and he said that, at the moment, Wednesday is looking like a good day for my Round Jersey solo swim. So, I fly out tomorrow morning and hopefully will be on my holidays in Cornwall by Friday evening. The Jersey Long Distance Swimming Club have their own tracker which should be on the boat and you can follow it at bit.ly/jerseytracker on the day. There may also be the odd update on the @JLDSC Twitter account.